Even with no light we're gonna shine like gold. Madonna's new song, Ghosttown, literally topped my recent music chart. If there are these types of songs which you can listen non-stop, so to say from dawn to dusk and from dusk to dawn, then 'Ghosttown' is among them for me. And most definitely this song is one of my favorites from Madonna herself, especially when it comes to her latest singles. Basically, music is one of my biggest driving forces. I can do nearly everything with music in the headphones or in the background. When I work out music is there, when I take a shower or a bath music is there (sometimes only in my head), when I drive a car music is set to the highest volume, when I stroll around alone music is there, when I take a break music is there. I wake up and go to bed with music. A book or a movie can replace music. Still there are two points, when music is not allowed. When I write and when I read. These two require a complete quietness. At these moments nothing and no one really exists. And by writing I don't mean chatting with friends and posting 'What's on my mind' statuses in social media. By writing I mean either creating my storytellings or other sort of written works that require a 100% of my brain attention. Speaking of the 'Ghosttown' single involvement in this story. In most cases I give my stories the titles that at least partially are related to those stories. So making a name out of the blue is not really my kind of thing, though I can't go by without it. Still, what's so relatable between Madonna's single and such a cute look you would ask. Ghost town is all about the location. The location that reminds you more of such a ghost town, as if it exists, but still you can't say that for sure. Ghost towns are the kind of cities that had long been abandoned, forgotten and lost to people. They are indescribably beautiful, charming yet frightening. I've already talked about this beautifully old park of Ķemeri in the RUINS story. Certain parts of Ķemeri really remind you of such kind of a city or a city that is on the verge of joining the list. 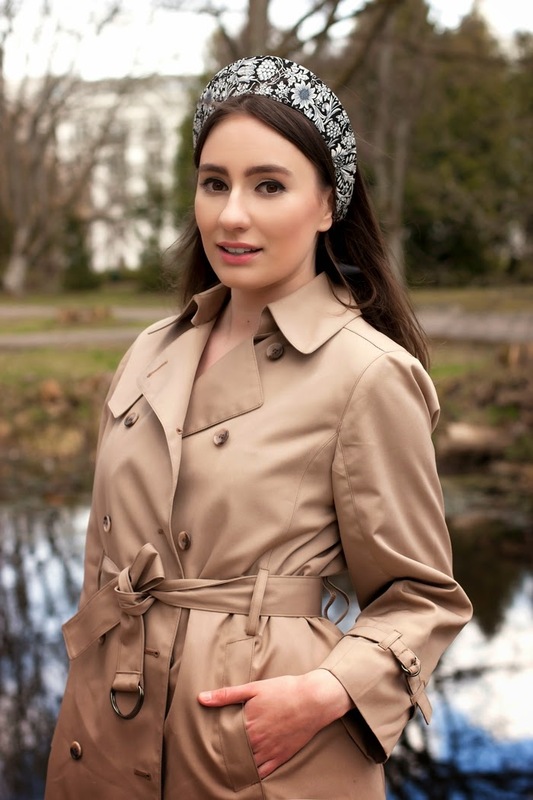 The outfit as opposed to the location and the name of the story is not about ghosts or towns or both of it. It's about the synergy of different pieces. 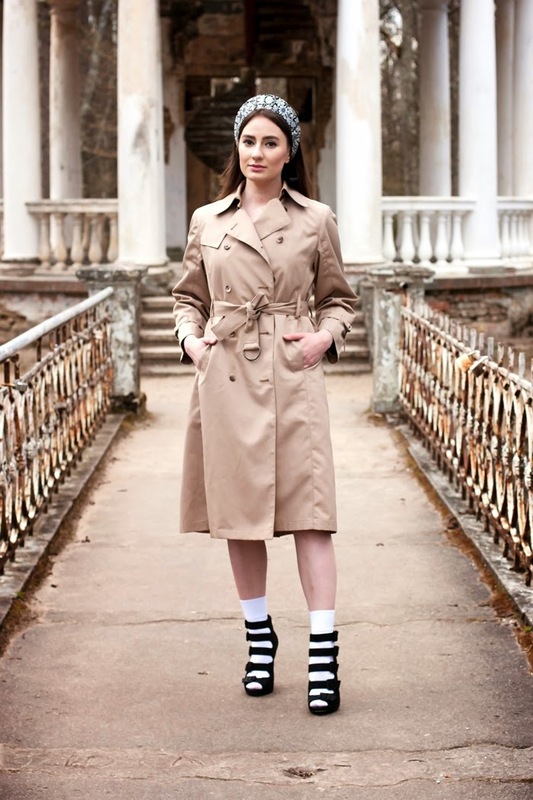 Timeless classics, aka trench coat, edgy heels and simplest white socks. 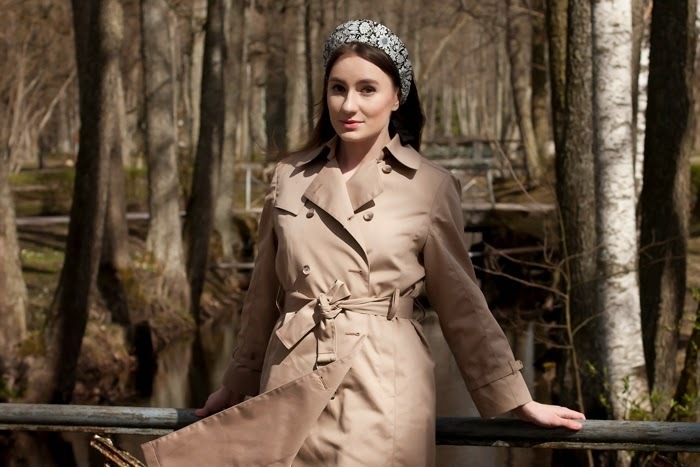 And my favorite of the season, Russian culture inspired, Veretteno crown. This outfit could never be pulled without #myVeretteno.